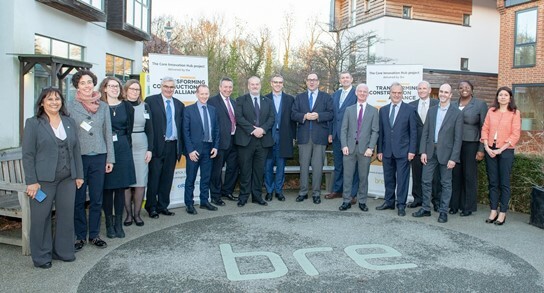 The Transforming Construction Alliance, which will deliver the new Core Innovation Hub for construction, is led by Keith Waller. He sets out some of the challenges and opportunities the sector faces and describes how the Core Innovation Hub can act as a catalyst to transform the sector. The construction sector employs around 10% of the UK workforce, but remains fragmented and mired in a transactional, low-margin cycle. As a result productivity growth, investment in innovation and skills development lag other sectors of the economy. Both the 2017 Industrial Strategy and the Infrastructure and Projects Authority’s Transforming Infrastructure Performance point to solutions which incentivise investment in a more productive, digitally enabled, manufacturing-led approach to delivery. In a fragmented market of both clients and industry, the Construction Sector Deal can help to coalesce action and best practice. The Core Innovation Hub (CIH) will play a central role in the meeting the sector deal’s ambitions, developing the ‘rules’ for new products, platforms and solutions that embed best practice for data management and advanced digital and manufacturing from other sectors of the economy such as automotive and aerospace. The potential for this to be transformational to the sector is enormous. It will unlock new and innovative businesses to bring products and solutions to market, creating long-term and sustainable jobs. It can help to improve the delivery of the UK’s ambitious infrastructure plans, enabling government to become a more innovative client, and for this approach to scale to projects across the whole sector. But not only will it help boost the productivity of the sector, it will also deliver better outcomes for society, the environment and the economy. 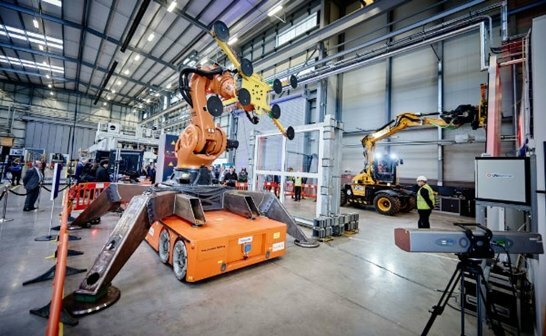 By driving advanced manufactured solutions, we will be helping to rebalance the economy by creating jobs and economic activity in manufacturing heartlands and areas of high unemployment, over time replacing concentrations of non-productive, labour-intensive activity on construction sites. Manufacturing can support significant reductions in the volumes of waste sent to landfill, driving cleaner, more sustainable buildings, kinder to the environment and using less carbon ion production and operation. Data will become an increasingly valuable commodity, not just for measuring performance, but giving material traceability, so we will know what has been installed, where, by who and to what standard. This will help address many of the concerns raised in Dame Judith Hackitt’s report following the tragedy at Grenfell. Quality will improve, with fewer defects and rework – another key Hackitt finding – improving the users’ experience and speeding delivery, reducing disruption to businesses and communities. Safety on site will improve, with fewer interfaces and activities taking place outside a controlled environment and less workers put into dangerous environments. This in turn should help boost the attractiveness of the sector to a more diverse workforce that better represents the society our built environment serves. However, these outcomes will not happen without co-ordinated effort and a clear plan. We still build too many prototypes. Projects are often unnecessarily bespoke; designed differently, procured individually and built inconsistently. Changing this is what this Construction Sector Deal offers and what the Core Innovation Hub will deliver. "It can't be about asking 'how cheap can you design and build it?' We must start to value beyond just the initial cost and start looking at the whole life performance and how investment in the built environment can better support delivery of wider social, economic and environmental outcomes." So as the Core Innovation Hub creates the standards that unlock productive, digitally-enabled manufacturing at scale, it will need close collaboration with industry to develop the products, platforms and procedures that will increasingly become a key part of a smarter built environment. But clients, and in particular government, must play their part. To deliver this transformation will require them not to ask for the same things in the same way. It cannot be about asking “how cheap can you design and build it?” and “how much risk are you willing to take?” We must start to value beyond just the initial cost and start looking at the whole life performance and how investment in the built environment can better support delivery of wider social, economic and environmental outcomes. The way clients procure, contract, pay and incentivise must change – and the business models of industry must adapt to unlock the latent productivity and innovation that sits across our suppliers. If we all get this right, the UK will be able to deliver more for less, with buildings and infrastructure that perform better over their whole lives, delivering better services and less disruption. We will have an innovative, profitable and productive industry that invests in continuous improvement, supporting a diverse, skilled workforce. Through this, the UK’s ongoing, long-term investment in our built environment will deliver better social, economic and environmental outcomes, boosting productivity and earning power throughout the UK. I look forward to your input and to keeping you updated on our progress as we embark on this journey of transformation. Civil engineer Keith Waller is the programme director for the Transforming Construction Alliance, which will deliver the Core Innovation Hub project. Keith has been seconded from Costain into HM Treasury for over eight years, working across government and industry to boost performance and improve outcomes for the construction sector. Going forward, Keith will be contributing regular articles to Infrastructure Intelligence.